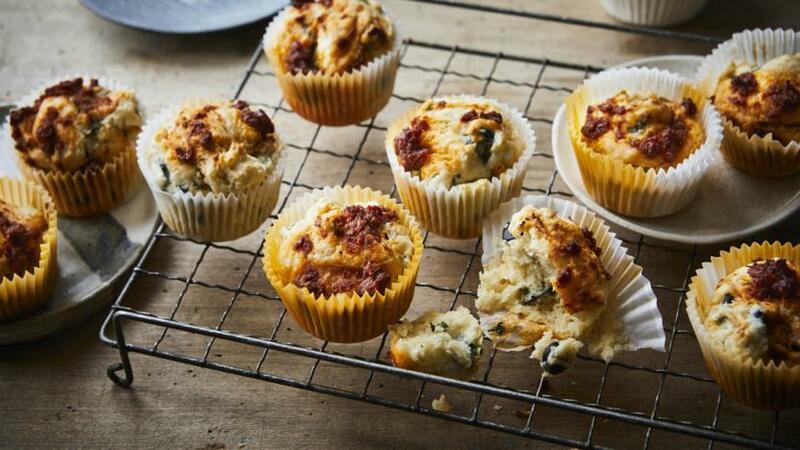 Mary Berry's quick savoury muffins are superb with soup, salads or for eating on the go. The cheese is lovely and oozy if you serve them warm. Eaten cold, they are still fragrant, with a nice saltiness from the cheese and olives. For this recipe you will need a 12-hole muffin tin and muffin cases. Preheat the oven to 200C/180C Fan/Gas 6 and line a 12-hole muffin tin with muffin cases. Measure the flour, baking powder and salt into a large bowl. Mix the butter, egg and milk together in a jug. Add the cheese, basil and olives to the bowl of dry ingredients and mix well. Pour in the wet ingredients and gently stir everything together using a fork. Loosely swirl in the sun-dried tomato paste to give a rippled effect through the batter. Divide the mixture between the cases and bake in the oven for 18–20 minutes, or until well risen and lightly golden brown. Remove from the oven and allow to cool slightly. Serve warm or cold. If you can’t find muffin cases, you could use cupcake cases; they are larger than fairy cake cases, but not quite as deep as muffin cases, so the mixture may stretch to a few extra muffins. Gently swirl in the sun-dried tomato paste, without stirring it in completely, as this gives a lovely hit of tomato when you eat the muffin, as well as a nice rippled effect.